« You Wanted to Know: Do Indians have a free ride to college? Meet Nataanii, another scholarship recipient awarded for academic year 2012-2013 by the American Indian Education Foundation (AIEF). 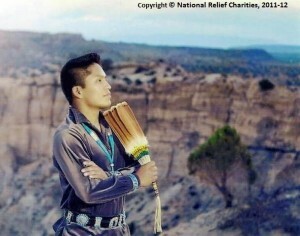 Nataanii is a Diné (Navajo) student from New Mexico. He is very connected to his traditional culture and is motivated to become an advocate for, and inspiration to, the youth of his tribe. Nataanii’s ultimate goal is to utilize his education and experiences to one day lead the Navajo Nation. In high school, Nataanii worked hard to be a well rounded and successful student, but he encountered obstacles along the way to earning his high school diploma. Although he recognizes that youth everywhere face challenges and obstacles, he realizes that conditions can be especially critical on many Indian reservations around the country. …our Native youth must overcome a myriad of complicated impediments such as intergenerational poverty, a lack of higher educational opportunities, the dichotomy of navigating the path between Native culture and expectations and its Anglo counterparts, and the higher than national averages of almost every adverse social issue. Yet, Nataanii’s dream was bigger than these obstacles, and he remained focused on earning a college degree, studying diligently to graduate from high school and gain entrance to one of the most prestigious universities in the country. 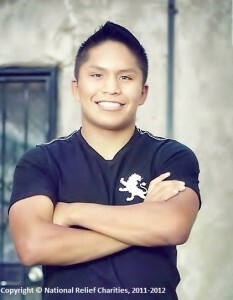 Now a freshman pursuing his Bachelor’s degree in Business Administration and Management, Nataanii draws on the skills and experience gained while working with leadership organizations such as the Diné Youth Council and the United National Indian Tribal Youth. He also looks to these experiences to remain inspired toward his ultimate goal of giving back to his home community through leadership and education. Nataanii has stated: “Education is the vehicle I’ve chosen to use to help my people.” And I find it inspiring that he wishes to encourage the youth back home to pursue post-secondary education. He is determined to make positive changes for the Navajo people. In closing, I want to say that although Nataanii is just beginning his journey through college, our American Indian Education Foundation team feels assured that he will, indeed, accomplish what he has begun. That he will become the leader he strives to be, ready to lead his tribe. Nataanii views his education as a tool which will cultivate him into the concentrated and powerful spark that will ignite the positive change he envisions for his tribe. Nataanii’s aspirations to become a selfless tribal leader were evident when he stated: “I’m a catalyst walking in the footsteps of my ancestors in pursuit of my dreams.” These are very moving and inspiring words from an incredibly motivated young man. AIEF is proud to award Nataanii a scholarship for this academic year. This entry was posted in Programs and tagged American Indian, American Indian Education Foundation, Dine, education, Native American, Navajo, Navajo Nation, scholarship, United National Tribal Youth. Bookmark the permalink. Trackbacks are closed, but you can post a comment. The world needs more young people like this! Working hard, against the odds. It was such a great deal seeing him work hard while with his busy schedule and he made it look like it was jus doodling on a piece of paper, im glad that i met him at the same high school we graduated from. I do a lot of work with this organization and I'm very happy that my nephew was awarded its scholarship! Great example for your people and others who just need someone to show them that dreams do and will come true if you work hard enough.